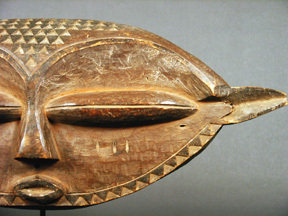 A classic and rare elongated mask of the Eastern Pende called panya-ngombe, not used in dances but to decorate the lintel of a chiefs hut. The mask is associated with chiefly insignia and reserved for the highest rank of tribal leaders. The image portrays the bush buffalo, an animal representing strength and prestige. 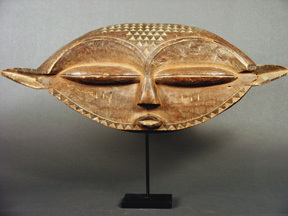 The use of masks as architectural sculpture is somewhat uncommon in Africa, while it is widespread in Oceania. Wood, traces of white pigment. On custom metal stand.